Is it really helpful to know all this? A discussion of weather science and aviation weather. The goal of this article is to give you an understanding of the science of what causes weather. This foundation will inform your experience with articles that follow this one about “Flying Weather” specifically (for example: tackling topics like – Flying Wind Shear, Sea Breezes, and Reading Clouds). Heating and cooling of atmosphere is responsible for the movement of afore mentioned atmospheres and thus responsible for what we call: weather. Understanding where heat comes from and how it transfers in the atmosphere is fundamental to understanding and predicting weather. Space IS cold, right? No… Space is, well, space. In that space (the area between matter) there is no medium for convection, conduction, or radiation (or at least very low capacity). If you were floating naked in space then you would get really cold, but this is not because space is cold, it’s because your body, like all bodies of matter, radiate your heat away. Without a source to replenish your heat energy, you lose it all. This is how clothing keeps you warm: by trapping, reflecting, and/or absorbing and radiating back to you, your heat energy. This is also a good concept for how the Earth is heated. The atmosphere is mother Earth’s favorite sweater and it works to trap, reflect, and radiate her heat energy back to her. The Earth would not be warm (enough for us anyway) in the first place if it were not for the Sun (a wonderful source of energy), or more accurately sunlight. Sunlight travels approximately 93 million miles through space to reach the Earth. The Earth rotates and so only half (approximately) the planet is hit by this light at any given time. The side that is in the dark radiates it’s heat away with only the great sweater (atmosphere) to keep it from going cold. The sunny side of the planet is gaining more heat than it’s losing from Sunlight. So, in summary, the Earth’s air (atmosphere) is like a great sweater for the Earth. This sweater helps retain the heat of the planet from completely escaping (radiating away) faster than the Earth can turn back to the Sun and get more heat. The rotation of the Earth also helps cool (via radiation) the Earth and prevents temperatures from getting too hot. Great! Let’s continue on with our discussion on Earth’s sweater (aka: Atmosphere) and why the Earth’s sweater seems to be made of 100% headwind. The atmosphere of Earth is a layer of gases surrounding the planet Earth that is retained by Earth’s gravity. The atmosphere protects life on Earth by absorbing ultraviolet solar radiation, warming the surface through heat retention (greenhouse effect), and reducing temperature extremes between day and night (the diurnal temperature variation). The common name given to the atmospheric gases used in breathing and photosynthesis is air. The atmosphere is fixed to the earth via gravity and rotates with the earth, or at least that is what it is trying to do. Other forces effect, or interrupt that simple effort by the atmosphere. Understanding the forces that upset the atmosphere’s stable parallel with the rotation of the earth is the keystone of a pilot’s ability to determine likely weather conditions (including stability of the air) for a given flight. The Sun’s photosphere emits light that is both visible and light that is not. At the top end of the visible spectrum is the color (or wavelength) red and at the bottom of the visible range is violet. Light that is outside of this visible spectrum (below red) is IR (infra red) and light that is above violet is UV (ultra violet). The Earth receives energy or heat from both the visible and the invisible light emitted by the Sun. → So you are flying VFR on a nice overcast day, and your thinking, “I don’t need sunscreen today”, well… No, you still need sunscreen (need might be too strong of a word, but it’s a good idea). Remember you are way up there in the sky and there are tremendous amounts of invisible light coming into that cockpit to travel with ya, or rather, to be absorbed by your face. Anytime you are at altitude, remember the sun is closer and stronger and you are also closer to the reflecting clouds … wear the sunscreen, even if you cannot see the light, it’s there, like Obi-Wan… just watching you… waiting to give advice. 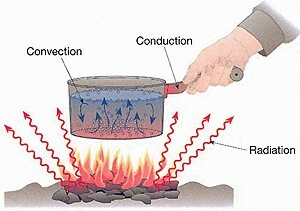 Conduction: is the transfer of heat from one molecule to another within a substance. Temperature is just the measure of the average kinetic energy or speed of the molecules in a substance. Photons moving quickly and running into things moves other things and thus the transfer of heat energy via conduction. When heat is transferred through conduction, it flows from warmer to colder regions and will transfer more rapidly with greater temperature differences. The rate of heat transfer through conduction also depends on whether the substance is a good conductor. It turns out that air is an extremely poor conductor of heat. Therefore, conduction is only important in the atmosphere within the first several millimeters closest to the surface. → So you parked the airplane in transient at KTRK Lake Tahoe. You spend the night losing valuable money in casinos that for some reason never use all that money they took to update the interior design from the 70’s, and you enjoy every second of it. The next morning you go out to your plane for a 9:00 AM departure and there is frost all over the wings. The solution is obvious: grab the tow bar and wheel her around so the sun hits the wings. You say to yourself “good, now the sun will melt the frost faster,” but you read this article, and in your heart, you know the truth… the sun heats the metal on the wing and that metal is a wonderful conductor that melts the frost. It’s okay, no one hears your inner thoughts so you’ll get away with misspeaking. Convection: is the transfer of heat through the movement of a fluid, such as water or air. This type of heat transfer can occur in liquids and gases because they move freely, making it possible to set up warm or cold currents. Convection occurs naturally in the atmosphere on a warm, sunny day. Certain portions of the surface of the Earth absorb more energy than other portions. Therefore the earth’s surface and the air near the surface heats unevenly. The warmest air expands, becomes less dense than the surrounding cooler air, becomes buoyant and rises. These rising “bubbles” of warm air, called thermals, act to transfer heat up into the atmosphere via convection. Cooler, heavier air then flows toward the surface to replace the warm air that just rose. When the cooler air reaches the surface, it is warmed and it too eventually rises as a thermal. This circulation is referred to as a convective circulation or thermal cell. These “bubbles” or thermals can result in cloud formation. Convection transfers heat vertically into the atmosphere. In order for heat to be transferred to other regions, it must be transferred horizontally by the wind. The horizontal transfer of heat by the wind is called advection. → Have you ever been stuck in a conversation where some one is talking, talking, talking, and they just won’t shut up? So much so that the room gets warmer from all the “hot air” they are blowing into it? Me too. That’s convection, er.. advection, depending on if they are talking to the roof. Radiation: Unlike other waves, electromagnetic waves do not carry energy by causing matter to vibrate. It is the electric and magnetic fields themselves that vibrate. This is the reason why electromagnetic waves can travel in a vacuum where there is no matter. → This is best understood by use of a common experience we have all had with radiation heat transfer: An open flame. If you have ever stood by a campfire or had a wood burning stove in your home then you have felt the heat transfer known as radiation. The side of you nearest the flame gets hot while the other side of you remains cool. The air surrounding you does not change temperature due to electromagnetic radiation. Electromagnetic waves can travel through air, solid objects, and even space. Okay, so basically light (waves or frequencies of solar radiation) travels a long way to earth carrying lots of energy. Some of that energy is absorbed in the atmosphere (mostly IR and UV light) and some visible light is reflected by clouds and absorbed by H2O, carbon dioxide, and methane, the rest hits the Earth’s surface. The earth is round, and thus light from the Sun hits the Earth in an uneven fashion. The poles (north and south) receive the light from the sun at an extreme angle, where the equator gets it at the most direct angle. The more focused and direct the light hits an object (such as the earth) the more energy (heat) is transferred with it. We use terms like: “the light is at an extreme angle,” but that’s a little misleading: see, it’s the relative angle of the source of light, the Sun, and the surface of the Earth in which it is being spread over. This is important because evening and morning light, be it at the equator or not, has a more extreme angle than the light at say “high noon” and thus will have similar effects of heating the surface of the Earth less because the same amount of energy is spread out. Likewise, the surface of the Earth does not absorb the equal amounts of energy. This is because different colored objects absorb energy at different rates. This is partially due to Albedo: the amount of reflection from a surface. The darker and duller an object, the more energy it absorbs. It should also be understood that the more energy an object absorbs, the more that object radiates energy back out! This is known as “black body radiation”. So a dark asphalt parking lot will absorb tremendous amounts of energy and radiate energy back for quite some time after the sun has gone down. The radiation of energy from the Earth’s surface is much weaker than that given by the sun, and the time in which the Sun is not “giving” energy to the Earth is short enough (meaning that the Earth has lost less heat than it receives from the Sun in a given day) that the Earth is able to maintain an average surface temperature of 59 degrees Fahrenheit. This is in large part due to the Greenhouse effect. The greenhouse effect is basically the fact that that the atmosphere stores energy radiated by the sun, also by the Earth and thus it radiates energy (heat) back. Like the Earth, the atmosphere keep radiating as long as it has energy. This Greenhouse effect is enhanced when more matter is in the sky such as clouds. Cloud cover will not only absorb, hold, and radiate more energy but they also reflect energy back down to the Earth. 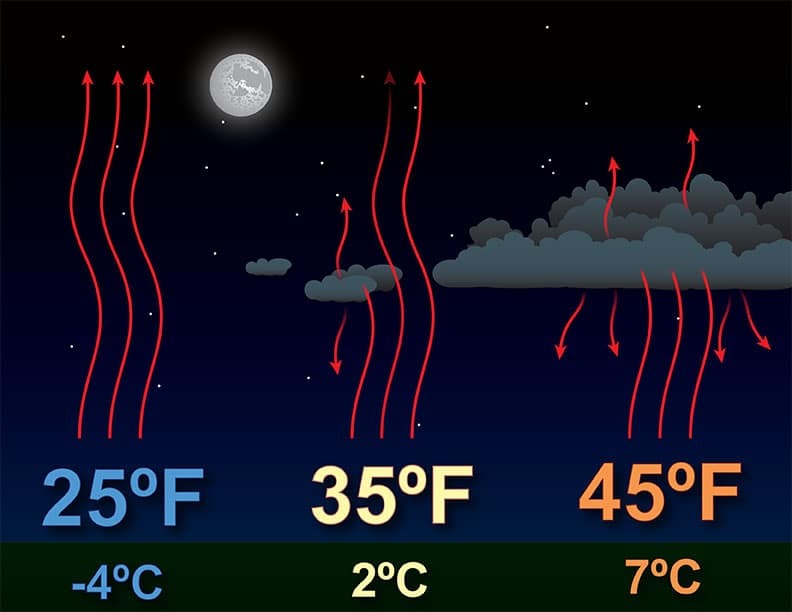 In a nutshell, an overcast night will stay warmer longer than a cloudless night. 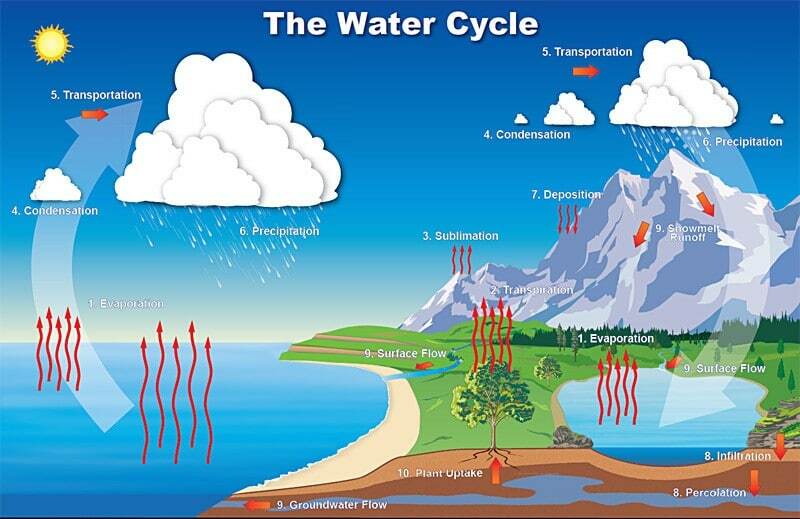 We also know that the more water in the air, the more greenhouse effect is having its, well… effect. The number one source of moisture for our atmosphere is the Earth’s Oceans. Water covers more than 70% of the surface of the earth, so you can understand why the oceans get their very own section in this study of aviation weather. Much like the air over the surface of the earth, the ocean currents work to move warm water toward the poles and colder water toward the equator. 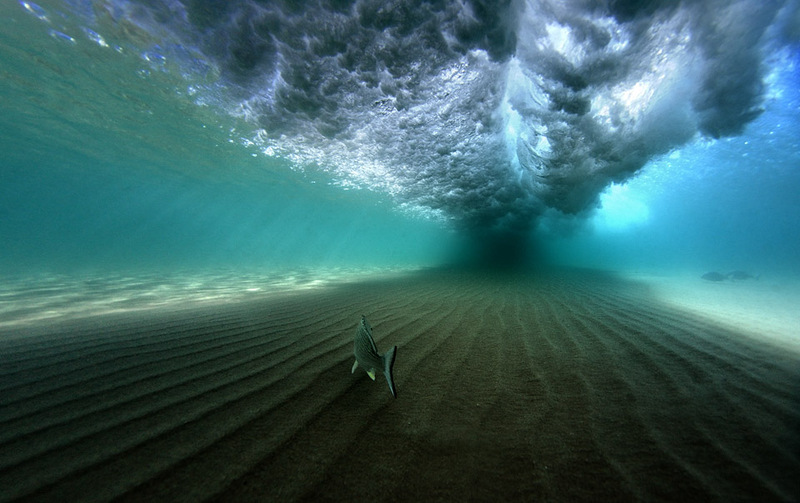 Unlike the ocean, the Sun’s rays do not penetrate deep into the earth. The transparency of the water allows the Sun’s radiation to get WAY down and thus transfer energy to great depths. In some places, like the tropics, light can reach depths of 200 meters. This means that it takes a great deal of energy to heat up the oceans and thus they remain somewhat temperate. By contrast, it means the oceans take much longer to cool and radiate warmth for longer periods of time (basically always). The ocean also can store larger amounts of heat than land can. In fact, the majority of Earth’s heat is stored in the oceans. So, if the oceans got “all the heat,” and the warm water in the ocean (like the warm air) is trying to switch places with the cooler water near the poles, then you can imagine how much the ocean currents have to do with the weather we face as pilots in the skies. 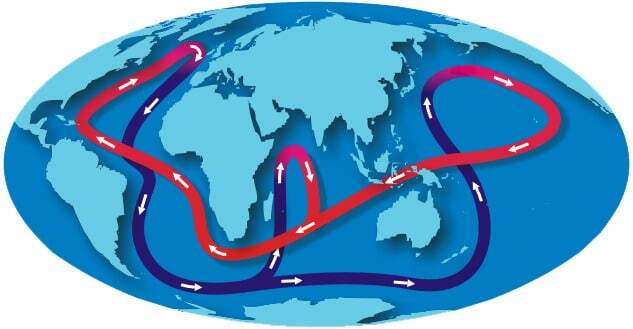 Major currents such as the Gulf Stream, send a whole lot of heat to the poles where heat transfers from warmer to cooler things until it equalizes. A little fact for you: The salinity of water effects the freezing temperature. Water with a salinity of 17% freezes at about 30°F (-1°C) and 35% water freezes at about 28.5°F (-2C). The Atlantic ocean is more salty that the pacific. For pilots who fly in coastal areas, this difference in heating and cooling can have dramatic effects on the weather in the form of sea breezes, which will have their own article as we continue to break down the weather sciences. I found it somewhat surprising to have not considered the Ocean’s currents and heat transfer for understanding weather. But doing so somehow made it a little easier to picture the flow of the air over certain terrain or even building a healthy respect for the awesome power of what was going on in the invisible air around the airplane. 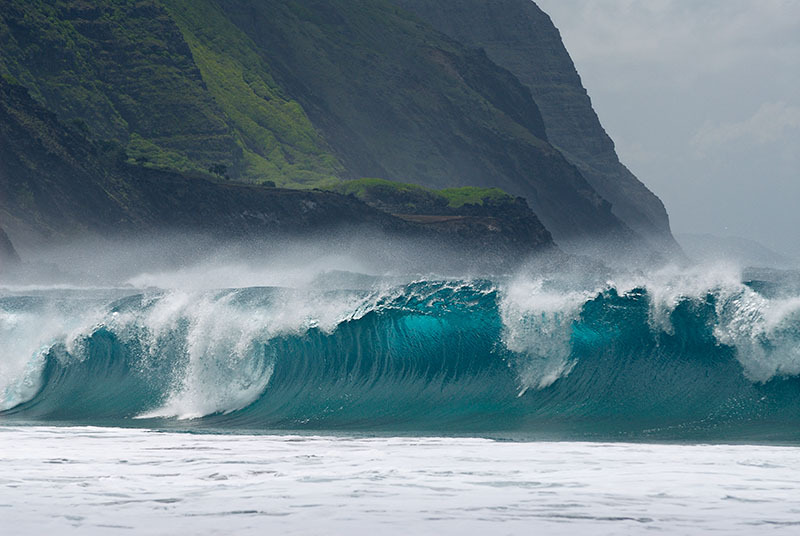 I was in Hawaii recently (February) and on the North Shore, there were some pretty impressive waves rolling in. Crowds of people would sit on the sand, far from the waves reach, and just watch in silence. Like being in a temple of some kind, everyone had a certain reverence and awe for what was happening. I found myself thinking of a flying trip I did to Mammoth Lakes one afternoon in a Cessna 172 and how it felt a bit like being caught in one of those massive waves pounding down on the aircraft. I thought of how the big difference was the difference in atmospheres and how if one were to think of weather like being in a submarine with wings, fully submerged under water, how similar the experiences would be. It’s remarkable how the rolling waves on the ocean resemble storm clouds in the sky . . . While on that beach looking at those massive waves, a life guard came up to us and warned of the area’s notorious rip tides. How they pull you out far enough to be caught in the Ocean currents around the islands and how there was no way to get back to land if such a thing happened. One such current would take you all the way up to Alaska before it let you go. Lucky for us, our aircraft are better swimmers but the visual of water somehow brings it together for me. Dense water below, thinner atmosphere above, churning, mixing, struggling for balance. I digress… The point is that the heating/cooling of the ocean and the currents caused by such heating affects the heating and cooling of the air. 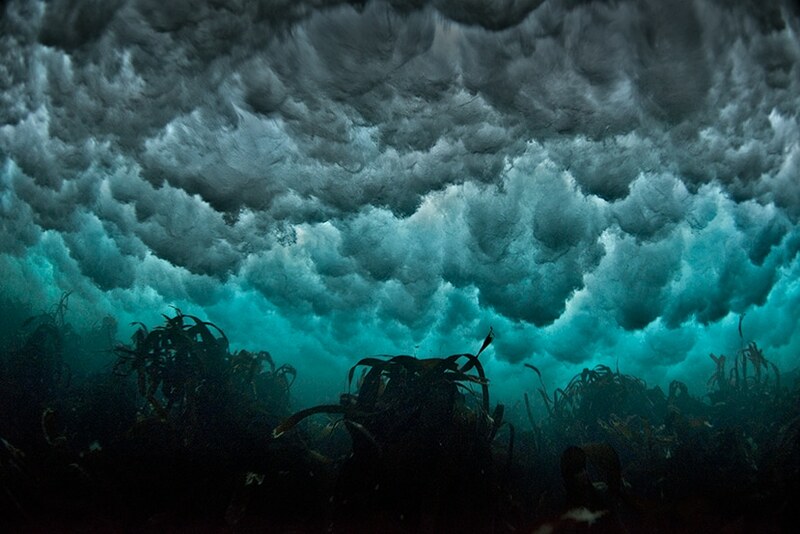 Two massive atmospheres (The ocean and the sky) both experiencing the same processes and you can picture the way one such atmosphere would behave in a situation to get insight into the other. One example of this that has worked well for me it the ridgeline wind and mountain waves. I have a great deal of experience with river rapids, eddies, currents, etc and for me to apply that visual as I approach the Sierras is fairly accurate and helpful. The next article that will follow this will not get into the science of what creates weather, but rather it will be on a specific weather phenomenon and the technique of flying though it.